Natural Flood Management or Natural Water Retention Measures is a means of alleviating flooding through the use of natural processes. Between January and June 2019, the Inishowen Rivers Trust will be collaborating with one of Ireland’s foremost experts on flooding and hydromorphology. 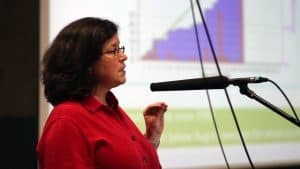 The Trust have engaged the services of Professor Mary Bourke, Trinity College Dublin, to carry out a study into possible options for implementing natural water retention measures in Inishowen. The study is titled ‘Natural Water Retention Measures in Inishowen – Community Engagement and Development of Strategic Plan‘ and is funded through a grant from the Office of Public Works. On 22nd August 2017 Inishowen was hit by a severe flooding event. This was a 0.1% flooding event, meaning that a flood of this intensity has a 1% chance of occurring each year. The flood left many devastated areas around the peninsula and there was substantial damage to land, property, homes and livestock. 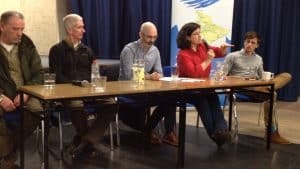 In an effort to understand the flood and look at ways forward, the Inishowen Rivers Trust organised an event in February 2018 entitled ‘Slow the Flow’ which brought flood experts to Inishowen. More details about this event and the presentations made on that day are available here (Slow the Flow). In addition you can read a review of the event in Issue 9: Winter 2018 of the Catchments.ie newsletter. Following this event the Trust applied for further funding from the Waters & Communities Office to run a series of flooding awareness events. These events ran during September and October 2018 in Carndonagh and featured talks on flood management and woodlands for water. Details of these events can be viewed here – Restoring Rivers and Woodlands for Water.